Crave Beauty Academy teaches students using the Pivot Point International educational system. Pivot Point has been in the business for decades, and provides helpful online resources to take beauty education to the next level. Crave Beauty Academy has been partnered with Pivot Point for many years because we love the quality of the education and the support it provides to students. Crave Beauty Academy is a Pivot Point Legacy School Partner. Some people have difficulty learning in classroom settings, which is why Pivot Point breaks the mold by striving to make the education into a lifestyle. Learning doesn’t end when the student steps out of the classroom, Pivot Point continues to find ways to engage with the student throughout their day. The learning materials are available to students on the iPads, laptops or tablets. Students can literally carry their education with them wherever they go! 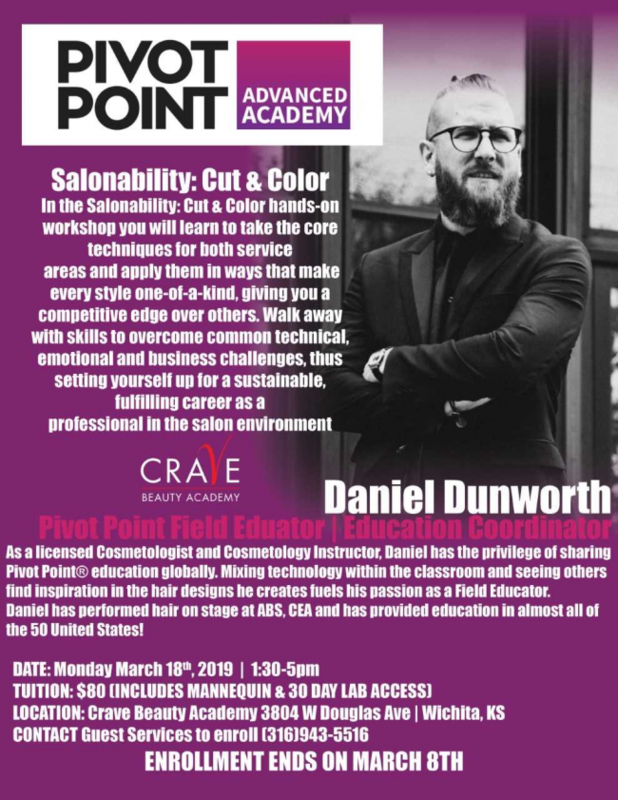 Crave Beauty Academy has the distinct privilege of becoming the first and only beauty school in North America that offers the Pivot Point Advanced Academy for Licensed Professionals! The Advanced Academy enhances the standard beauty and wellness education and takes it to the next level. The program has a heightened focus on the upcoming trends and continuing education in the beauty industry. The Advanced Academy offers classes to Crave students and to current licensed professionals. The program is an excellent resource for continuing education in the beauty industry and a resume-builder! We’re excited for the ways the Advanced Academy will help our students, alumni, and the beauty industry succeed! To join the first beauty school in the country to feature the Pivot Point Advanced Academy, contact us to learn more about how you can apply! The advanced academy currently available for our cosmetology program, and will possibly be added to our esthetics and nail technology programs over time. Book a tour and join the Crave family!